I’m not trying to sound trite, but it really does. The song is pop music entering into a dark twisted fantasy. 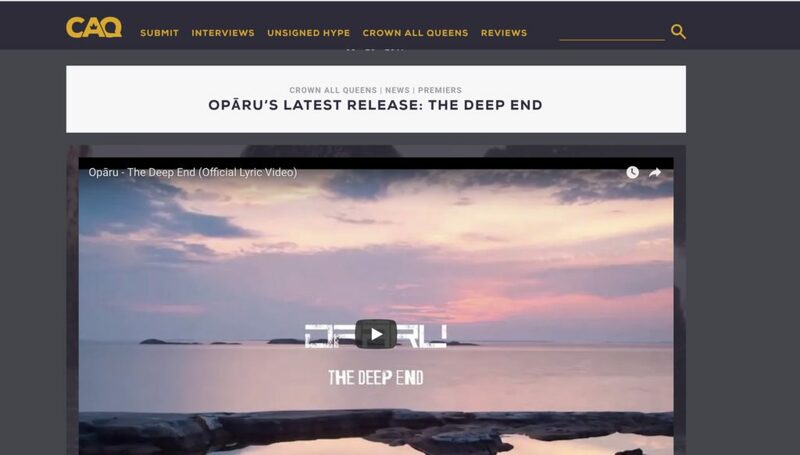 Opāru shows with this track that she’s not one for overplayed pop sounds and rhythms. Rather, Opāru uses a looped electronic beat to introduce her track. The beat is haunting and anticipatory. The beat switches once Opāru’s voice comes in, as it fades and allows her voice to shine. Opāru sings soulfully and sweetly, and her voice reminds me of lyrical and vocal legend, Sia. Additionally, in the official video for the song, the lyrics are added. In this way, the listener can connect on an even deeper level to the emotion and message of the song. The instrumental build up that coincides with Opāru’s vocals is what makes this song stand out. It is what gives it that “song of the summer” feel. It just has that je ne sais quoi that makes you want to hear it multiple times. The song hits the bass on that sweet spot. The drum beat is a perfect complement. It makes the lyrics hit harder, and the lyrics are quite catchy. “You’re still here, like an anchor off the pier, dive into the deep end, no sleeping through the years”. The song makes you want to sing along.